How Far Would You Go to Find a Lost Family Member? Murphy Braun is a five-year-old golden retriever who loves her family, and loves doing everything with them. This includes going on camping trips in the beautiful ElDorado National Forest. But one camping trip didn’t go as planned. Murphy was lost in the forest; no matter how hard her family searched, they couldn’t find her. She spent many months alone in the wilderness, fighting to survive. Will her family ever find her? 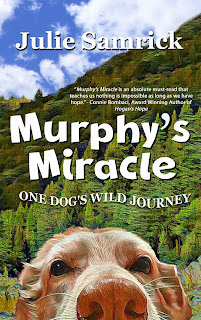 "Murphy's Miracle is an absolute must-read that teaches us that there are indeed many more good people than bad and that nothing is impossible as long as we have hope." Connie Bombaci, award-winning author of Hogan's Hope.